Tajikistan opted for Vahdat, or “unity” in Tajik, as the venue in which to commemorate the 20th anniversary of the end of the country’s traumatic civil war. It was a bitterly ironic choice. President Emomali Rahmon began his visit to the town on June 27 with the opening of a new multi-story police precinct. The old home for Vahdat’s police was a neat canary-yellow building a couple of streets away that authorities claim was attacked and rendered unusable during a coup attempt in September 2015 mounted by renegade deputy Defense Minister Adbuhalim Nazarzoda. The government insisted the precinct had been severely damaged in fighting, although when EurasiaNet.org visited the location in the days after the reported unrest, there was no obvious sign any shootout had occurred. All the same, the claims of a coup were enough to spark the effective undoing of the 1997 peace agreement that Tajikistan celebrated in pomp this week. Nazarzoda, a former member of the armed opposition who owed his official position to a power-sharing provision within the deal, was hunted down and killed following his purported mutiny. Afterward, the government seized upon the momentum to ban the opposition Islamic Renaissance Party of Tajikistan, or IRPT, the main political wing of the armed opposition during the war. As best as one can tell, around 200 IRPT members are now languishing behind bars — many more have fled the country. The anniversary concert in Vahdat was attended by Rahmon, officials from his administration, members of his family and representatives of the diplomatic corps. Nobody from the war-era opposition — including from such groups as Rastohez, the Democratic Party of Tajikistan or Lali Badahshon — appears to have been invited. In all the speeches made to commemorate the efforts made to seal the peace deal, the opposition was never mentioned. Instead, the official narrative has concentrated all plaudits for ending the war on Rahmon, who is even recognized with the official title Founder of Peace and National Unity. Anybody whose life was directly affected by the war itself — be it fighters or those who took refuge in neighboring Afghanistan — has been actively discouraged from sharing their memories in public forums. One veteran of opposition activism, a 60-year old resident of Dushanbe who asked to be identified only by the pseudonym Masrur Odinayev for fear of reprisals, said that he sees June 27 as a day of mourning. As a former member of Lali Badahshon, the Pamiri contingent of the civil war opposition, Odinayev occupies a social outcast status. For five years, he has been unable to land a steady job. 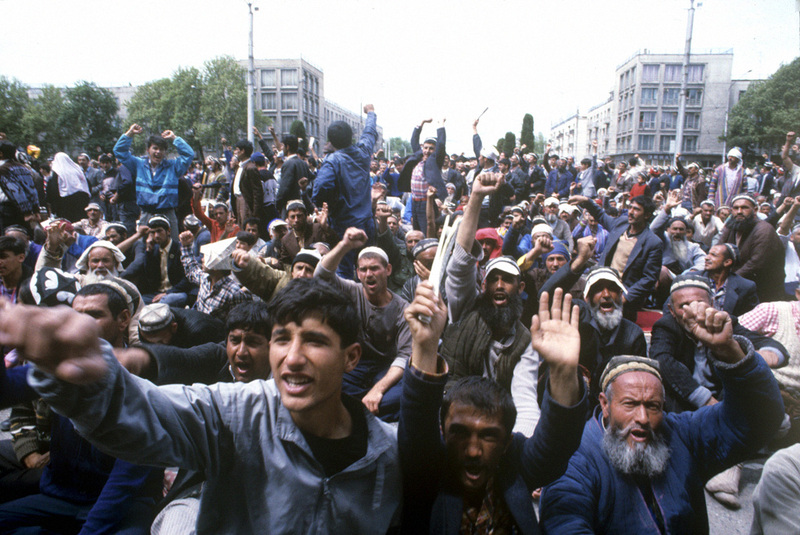 Many like Odinayev recall their decision to join the political rallies of early 1992 in Dushanbe, which set the stage for the conflict, with anguished disappointment. “On Shahidon square there were sparkling and interesting personalities like [former IRPT leader] Said Abdullo Nuri, [1991 presidential election candidate] Davlat Khudonazarov, [religious leader] Haji Akbar Turajonzoda. We thought about the future, we wanted freedom from Russia, like the Baltic states had got. We didn’t think about what was to come tomorrow, we forgot that we were a Russian colony and that Russia would never want to see a prosperous Tajikistan,” Odinayev told EurasiaNet.org. Muhammadsaid Rizoi, a member of the IRPT supreme council now based in Europe, offers an even more idealized account of the Shahidon rally, calling it a clarion call for democracy and end to cronyism. While these narratives vary considerably from that offered by the government, they similarly gloss over the regional aspects of the conflict. Among its specific political demands, the opposition had wanted to see the resignation of then-President Rahmon Nabiyev, an old-school Communist Party apparatchik from the northern Leninabad region who had been handily elected in an October 1991 vote recognized as the fairest ballot that Tajikistan has ever held. Stated in the crudest possible terms, the war saw northern Leninabadis allied with clans from Kulob, from which Rahmon emerged, against an agglomeration of interests from the rest of the country. By the middle of 1992, the Shahidon rally and the rival pro-government demonstrations on Ozodi square, only a short walk away, had dissolved and given way to fighting. The first serious gun battles broke out in Qurghonteppa. Dushanbe was seized by a scrappy but efficient opposition fighting force. The government’s corner was fought by the Popular Front, marshaled by a thuggish former jailbird called Sangak Safarov. It was not long before the government had crashed through opposition defenses with their superior firepower and taken back the capital. The majority of refugees took a more direct route to the south — to Afghanistan. No official reckoning has ever been undertaken to determine how many died or fled. Odinayev was candid that all sides had blood on their hands, although he argued the opposition was left with no choice. “We didn’t want to kill and fight. I don’t want to say the opposition didn’t kill, but ours was a response to the actions of the authorities,” he said. A comprehensive peace agreement bringing a close to fighting was brokered by a vast array of parties from the United Nations, the Organizations for Security and Cooperation in Europe, Russia, Iran and others. Rizoi, of the IRPT, argues that the 1997 peace agreement began to be flouted as soon as it was signed. In a provocative gesture, Rahmon in 1998 banned the wearing of beards in the army — a move transparently aimed at sidelining the religiously inclined opposition fighters that had been absorbed into the government’s ranks. The opposition duly ordered their men to shave their beards in compliance so as to avoid any grounds for disagreement. But there was no intention at any stage to return to the streets, said Rizoi. “We had always wanted to defend ourselves within Tajikistan’s legal framework. Going again onto the streets would have been interpreted as: ‘the party of war wants to start a war all over again.’ There were many attempts to provoke us into organizing rallies again. That was the plan to put an end to us,” he said.